Swipe has launched their latest smartphone, the Swipe Elite 2. 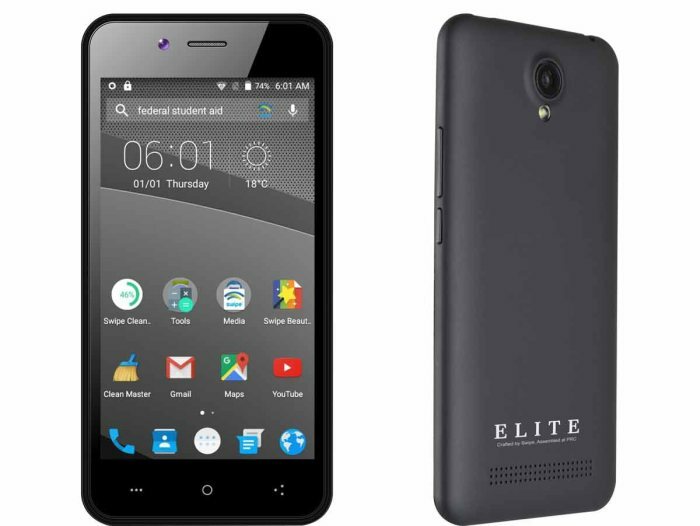 The Elite2 is one of the cheapest 4G LTE enabled smartphone in India. It is upgraded version of the Swipe Elite but many specs apart from network have been degraded. It is DUAL SIM smartphone with 4G LTE connectivity on both the SIMS. The Elite-2 has 8MP rear shooter and 5 MP front selfie cam. Swipe Elite 2 featuring 5inch 960 x 540 pixels qHD display is priced under INR 5K. It draws strength from 1.3GHz Quad-core processor and 1GB of RAM. To make the phone alive there is 1900-mAh battery. It is attained with 8 gigs of internal memory and runs on Android 5.1 Lollipop with Freedom OS. Some of its main rivals includes ZTE Blade Qlux 4G, Xiaomi Redmi 1s, Micromax Canvas Spark Q380, Yu Yunique, Coolpad Dazen 1, Yu Yuphoria, Canvas Spark 2 Q334, Samsung Galaxy J1, Blu Win HD LTE Micromax Canvas Xpress 2 E313 and Infocus M2 4G. It is 8.5 mm thick and weighs 84 grams only. The Swipe Elite 2 will be available at price of RS 4666. You can buy it exclusive from flipkart. It comes in Black color.